His first trip to India was back in 1985 and Timothy a�?Tiffa�� Needell remembers it like it was yesterday. He was racing in front of a crowd that was practically at the edge of the track, as the cars were zooming by. a�?I was the winner of the Bangalore Grand Prix and was racing for Vijay Mallya. I went to Madras as well and enjoyed the country immensely,a�? says the Briton, known popularly as a former Le Mans winner and co-host of Fifth Gear, an auto-show currently airing on Discovery Turbo. Though he is not sure when his next trip to India will be, we get chatting about what he has in store for us this year on Fifth Gear. a�?We dona��t just drive super cars, but have team tests that look at different models…we hope to cover almost every aspect of motoring,a�? 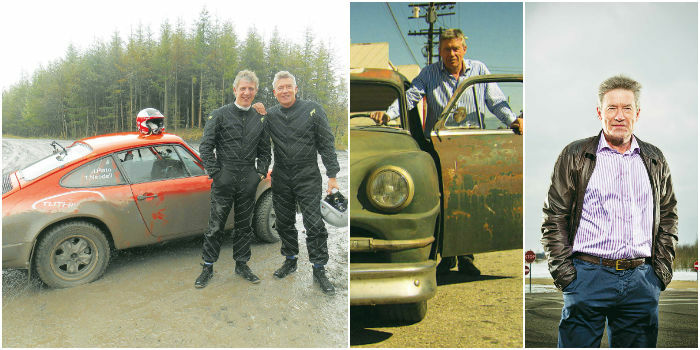 says Needell, about the show that started in 2002. The show also covers the latest in automobile trends. Resto modding is currently big in America, he says. a�?Ita��s the new style of restoring, where cars lookA� original on the outside but areA� incredibly advanced underneath the bodies,a�? he shares, explaining that they take a car from the 1950s, and restore it to its originality, but add a lot of performance mods or even a different engine. a�?A resto modded Ambassador would be perfect with a V8 Chevrolet engine under the body.a�? That said, he reveals that his all time favourites are rear-wheel drives, a�?like the BMW535i.a�? One of the highlights of the show is that they talk about cheap alternatives to new cars, if on a budget. And speaking of new cars, Needell feels that therea��s an overload of electronics in cars today. a�?With something like a Buggati Veyron, you dona��t drive it, you operate it. The car has 1,000 HP but will only give you what it thinks you should have.a�? Cars are more stable and safer, but for a driver, it takes a lot of thrill out of it, he feels, pointing out that the ultimate car for him is the McLaren F1. Before parting, we ask him what he thinks about Top Gear, the auto show on BBC. a�?Therea��s no competition really. Theya��re just a light entertainment show and wea��re a real car show,a�? he jests.